Slate Cabin is a writer’s retreat perched on the edge of Snowdonia National Park in Mid Wales, United Kingdom. The building is set in a lush green valley that is ringed by barren, windswept hills and grazing pastures. In response to this beautiful and yet harsh landscape, the cabin is a reductive black box that is anchored to the ground. It provides protection and respite to visitors who wish to escape the wind, rain and snow. 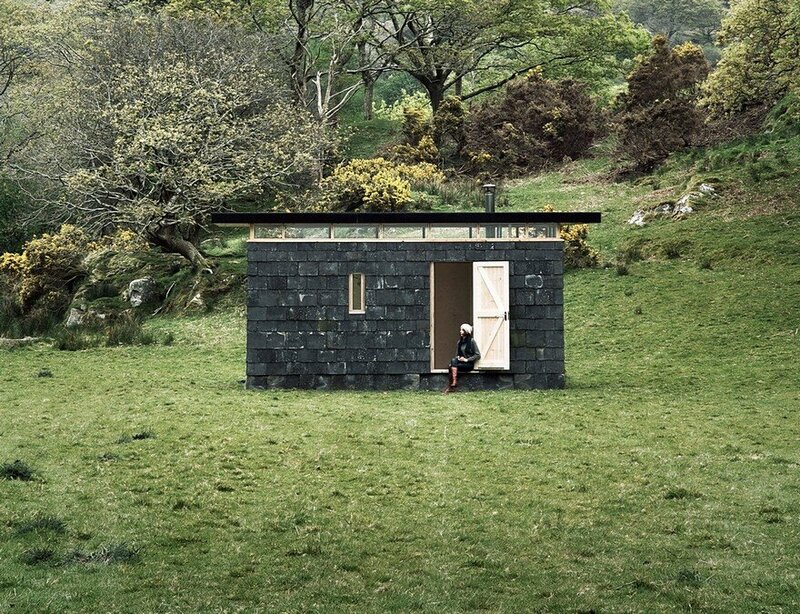 Slate Cabin is inspired by the very bedrock of Wales, a country built on – and of – slate. Wales is a unique landscape, scattered with stone-strewn mountains, abandoned quarries and old slate homes, which have stood for hundreds of years. These qualities encouraged us to base our design around this local and historically significant material. 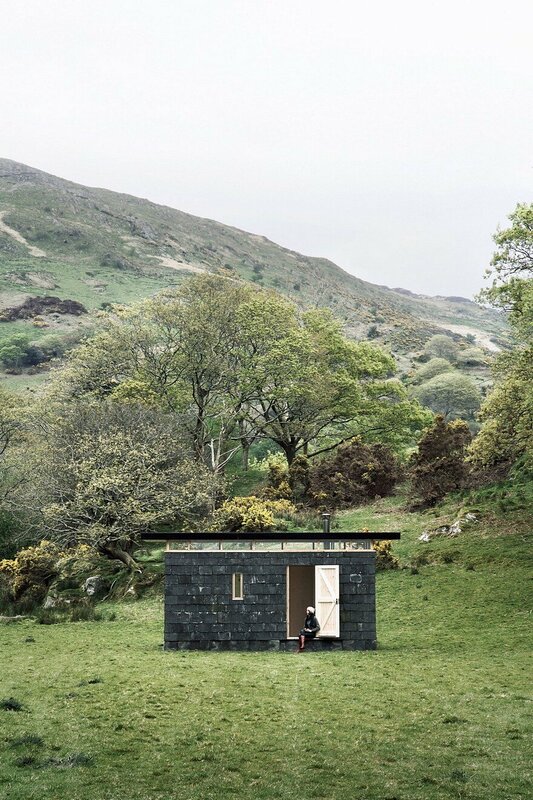 Slate Cabin is envisaged as a visual infrastructure for collecting and cataloguing Welsh slate. The exterior of the cabin is covered in local stone, which is fixed to the building like oversized shingles. These recycled slate tiles were reclaimed from nearby farms, and are mottled and pockmarked with weather and time. 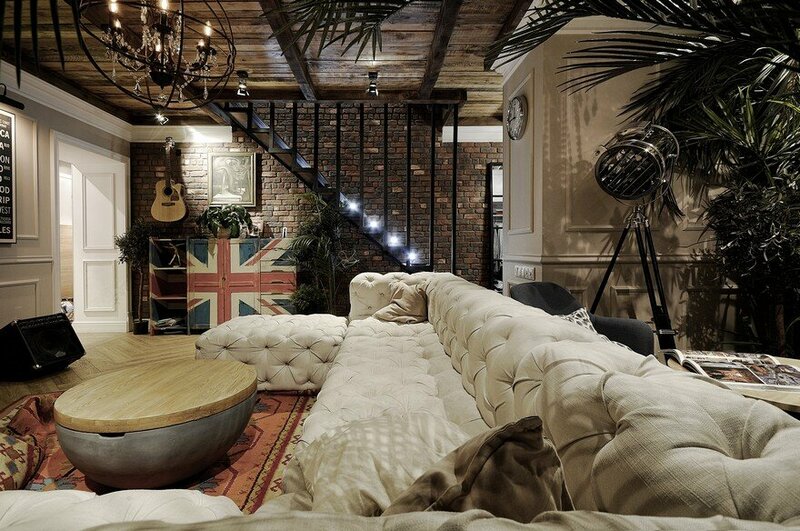 They result in a building that is at home in the hills, with a rugged and rustic appearance. 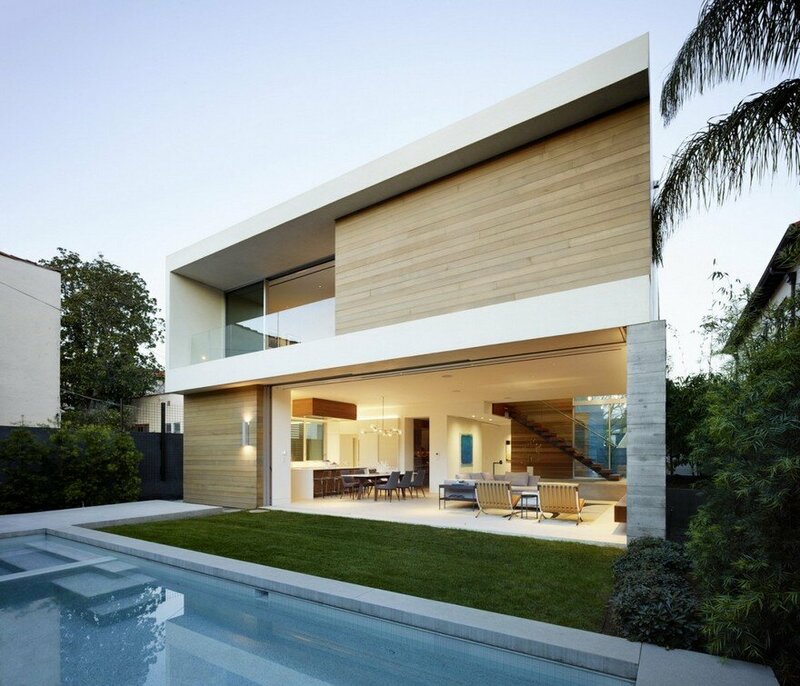 In essence, the building is a simple, rectangular volume. 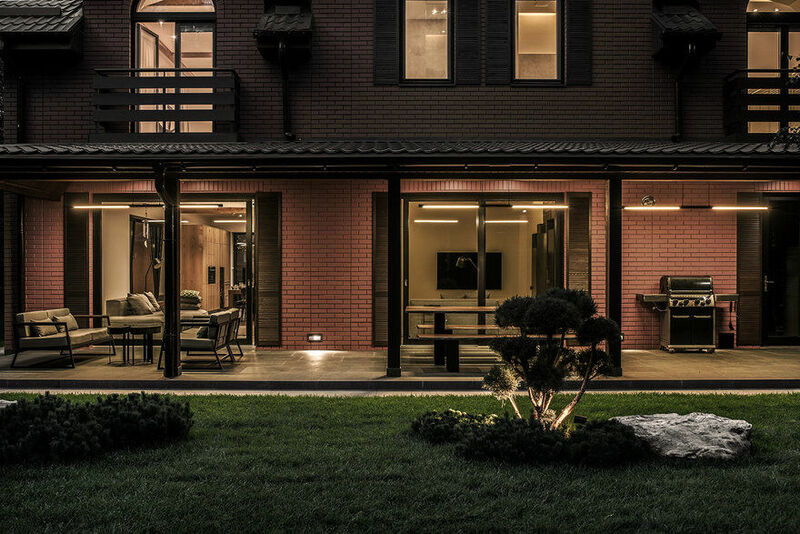 The exterior is dark and muted, with a contrasting interior that is honeyed and warm. The proportions of the building are elegant and restrained, while still meeting the tight footprint required by the design brief. Moving inside the cabin, one is welcomed by a light, bright interior space. 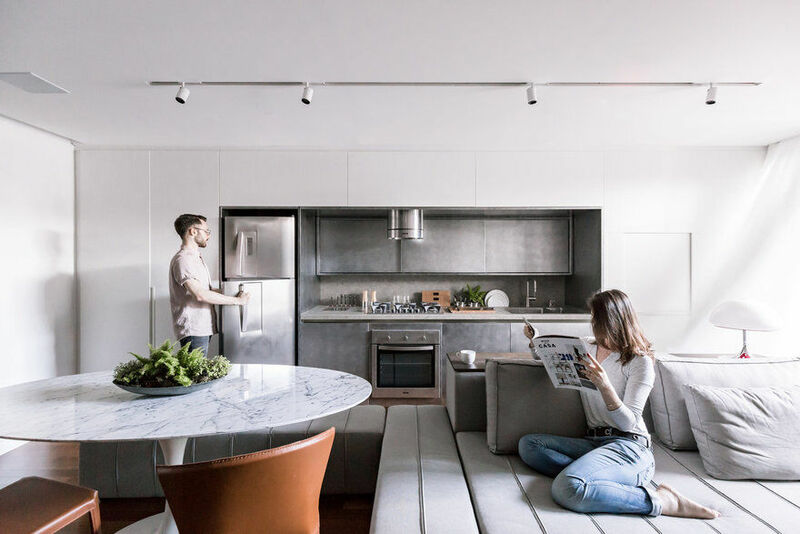 The spatial organisation is simple, with a single room for essential activities – sleeping, cooking, resting and relaxing – and a bathroom tucked behind. 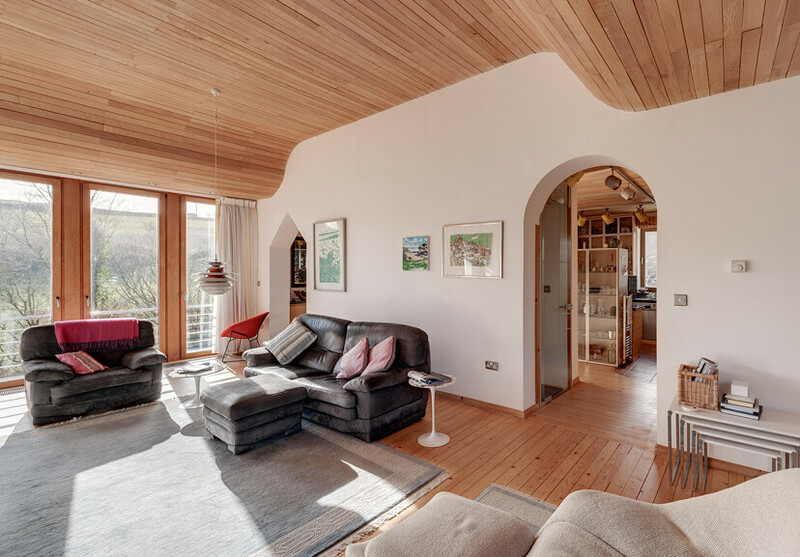 The main room is designed as a crafted piece of joinery. Subtle shifts and steps are used to differentiate between functions, creating rooms within a larger volume. 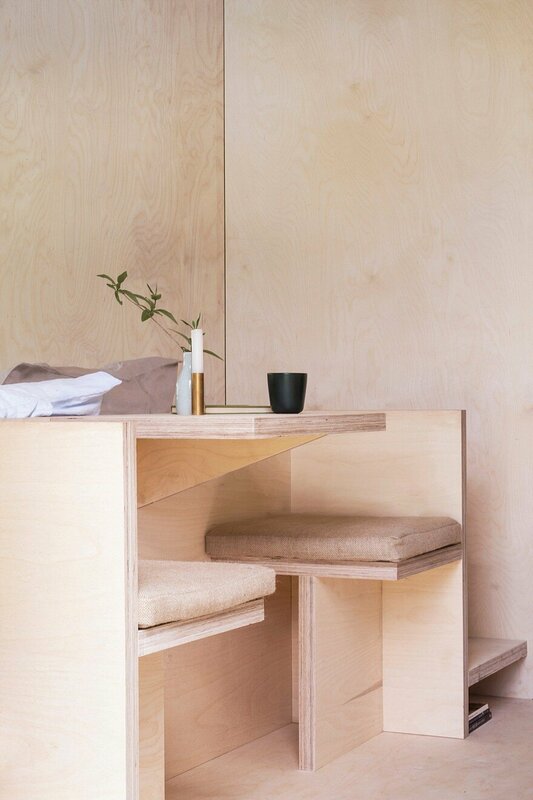 The bed sits up on a raised platform, and pulls back at one end to provide space for a seat and desk. The bed head, meanwhile, wraps around to house a built in seat and table. This acts as a cosy place to share meals, which can be cooked on a small, wood-burning stove tucked in one corner. 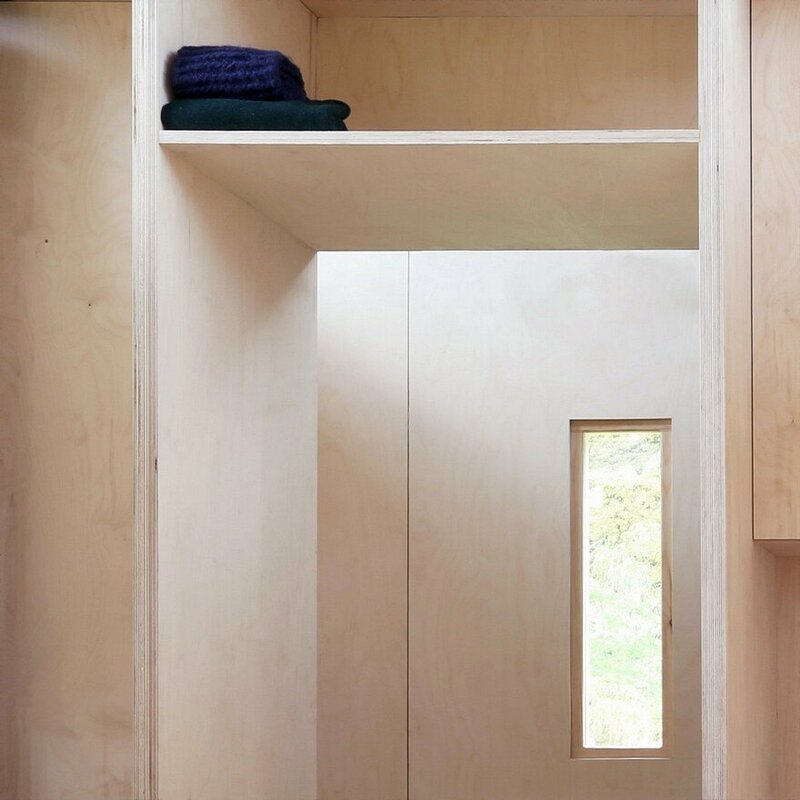 Elsewhere, storage and shelves are artfully integrated into the building design. Every millimetre of the cabin is meticulously designed and put to use. 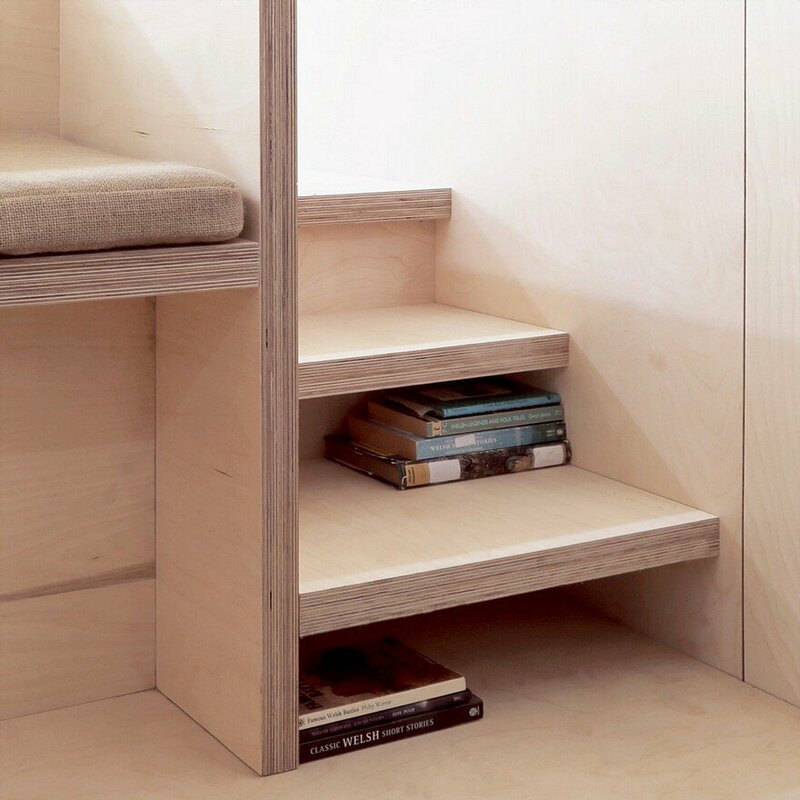 Stairs to the bed platform become a space to store books and shoes, while a shelf above the bathroom acts as a slot for stashing hiking packs. The space is a continuous balance of efficiency and comfort. All services are self-contained, which means that the cabin operates off-the-grid. Throughout the cabin, openings are carefully considered to capture small vignettes and views. 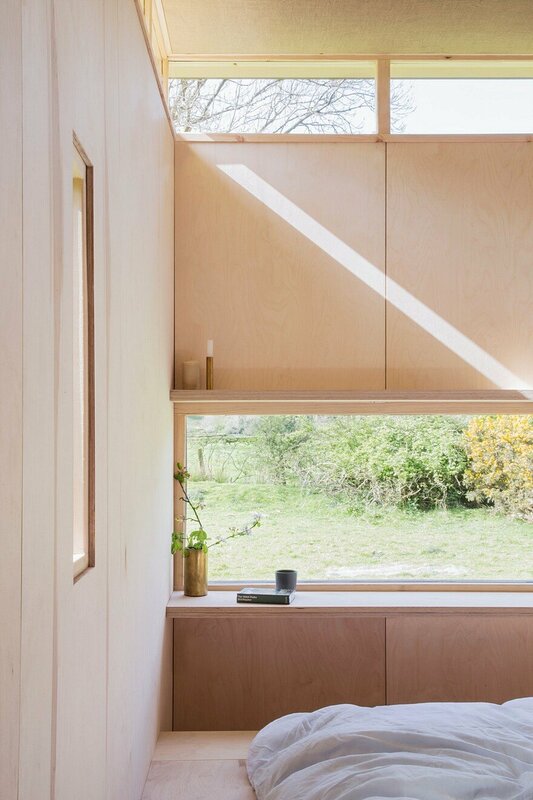 Along one wall, a slot window frames a long, panoramic landscape of mountains and fields. It’s a view best experienced when sitting or lying down. 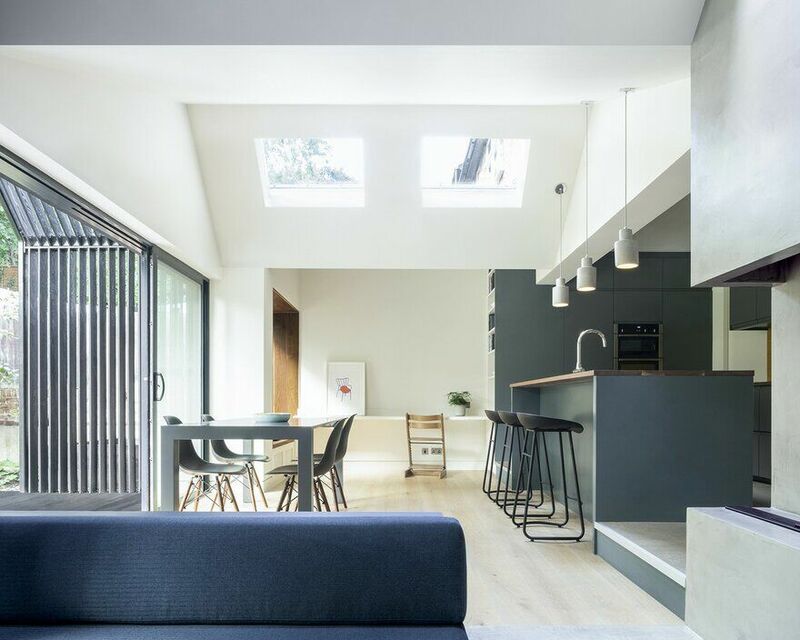 Meanwhile, a continuous lantern of high windows bathe the space in natural light. Glancing up to these windows reveals glimpses of passing clouds, distant hills and spindly, swaying branches. 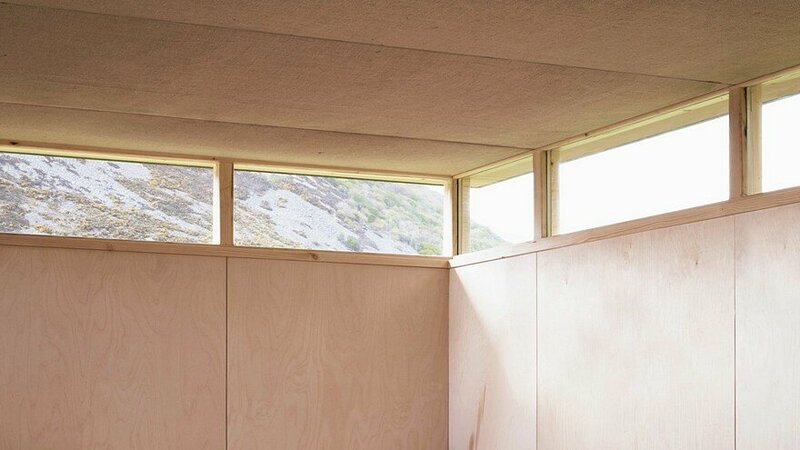 To create a serene experience, the cabin is built of as few materials as possible. Soft, gentle tones and textures intentionally contrast the stark stone exterior. 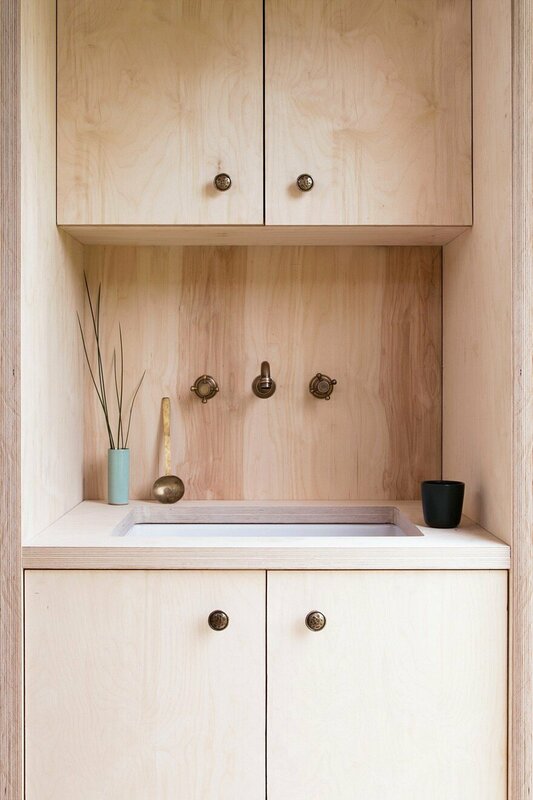 Almost all of the surfaces and joinery are lined in birch plywood, which softly diffuses the light. The ceilings are draped in a woven hessian, a playful reference to the rural context. 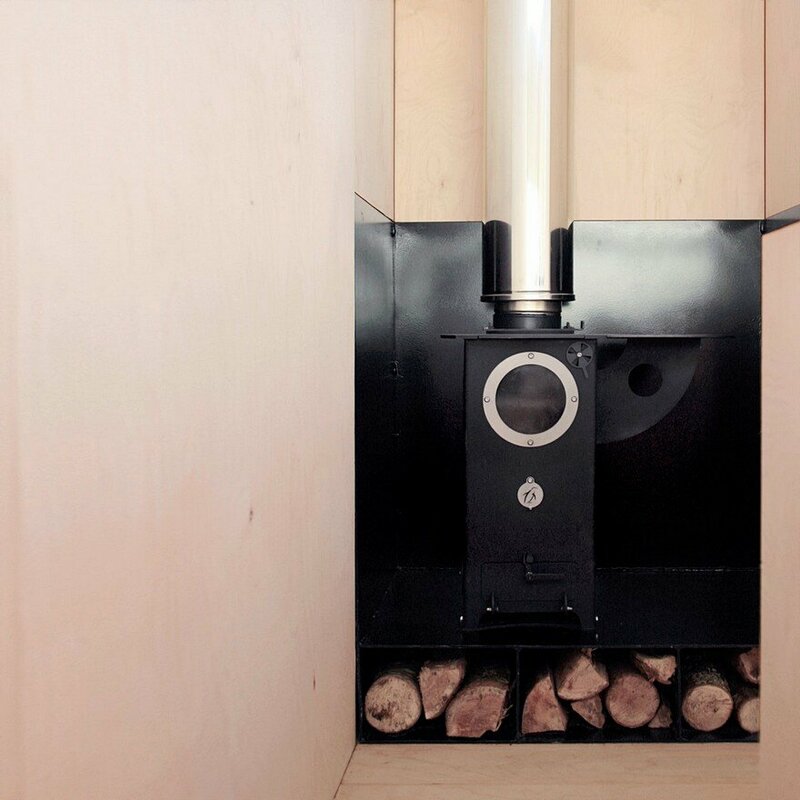 The wood-burning stove is a standout object, and is crisply outlined in a punchy, contrasting black. All of the fittings are burnished brass. The architectural approach explores the tension between permanence and impermanence, the efficient act of prefabrication and the slow beauty lent by natural materials. The building bears the traces of time, and is designed to blend in to its rural setting. Slate Cabin is a place of quiet retreat, where people might go to read, write and relax. As a space, it forms a place where nature can be viewed and contemplated. This design was commissioned as a result of an international competition process, with construction completed in 2017.